My Journey to Fit: FMM - A Little Danger Inside and Outside! FMM - A Little Danger Inside and Outside! Why yes, you are looking at three grill grates stacked on top of each other, with the pan of spaghetti sauce on top of that. Genius? Dangerous?? Probably a bit of both. I walked in the kitchen and saw his contraption, and after I took the picture, I lifted the lid to see the sauce simmering beautifully. Maybe he's onto something - but it's a good thing we don't have small children around who might bump the towering inferno he had going there. I love this! Madeline is our little neighbor across the street; I really don't interact with her except for a wave if we're outside, but this was too adorable. Of course I had to write her back; we'll see if any more Spanish lessons are in my future. Oh, and I signed my note with my name and also my "perro Paco" so I hope she knows I'm learning! 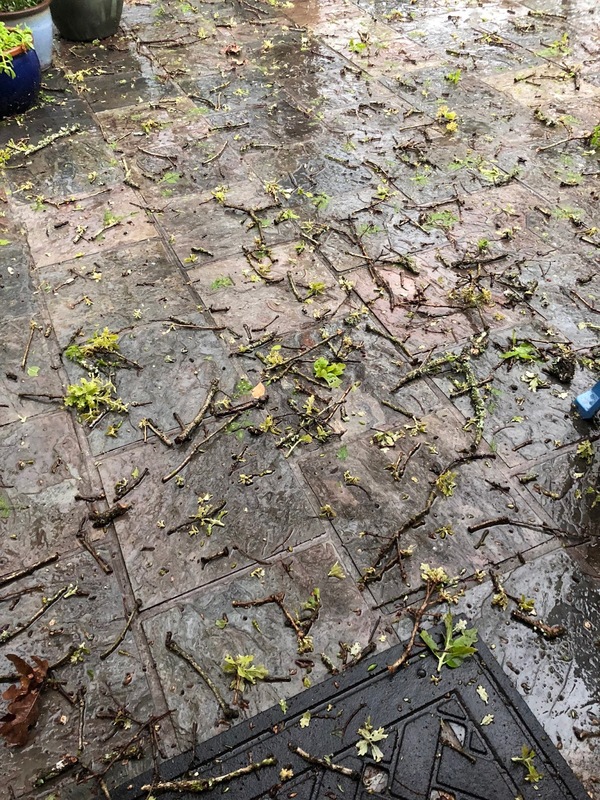 Our poor plants - they survived the hard freezes of winter only to be pelted by hail in spring! 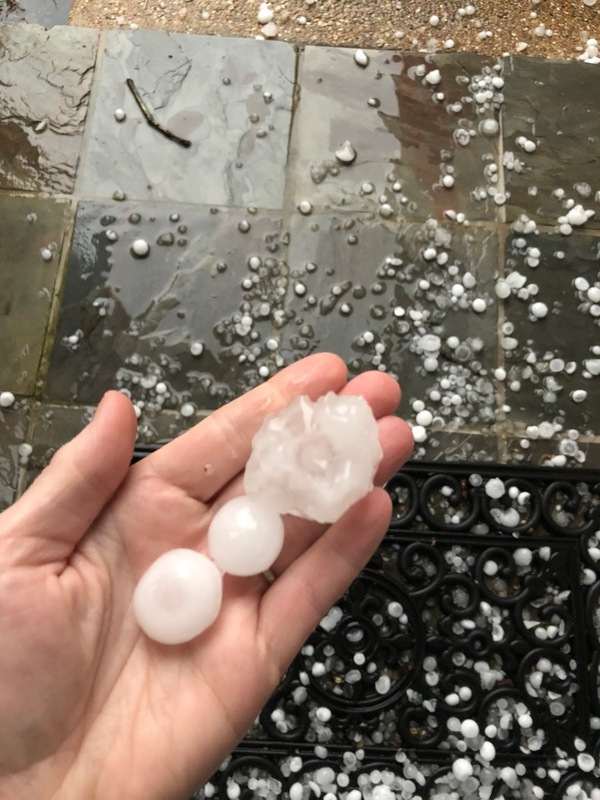 The larger piece was bigger than a golf ball - they weren't all that size, but there were plenty of the big ones falling. The next day, everywhere we walked outside was crunchy. How cute that your neighbors little girl is giving you Spanish speaking lessons! On Tuesday we got severe weather here it was so bad and scary I went to my "safe" place in my house. 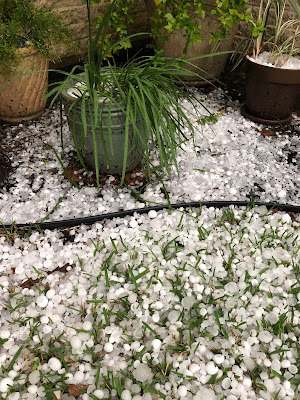 We took on high straight line wind, hail which I did not see but could hear hitting my room and windows I was truly afraid but it passed quickly and all is well with no damage that I know of. Dang Susan, that sounds terrifying! Glad you guys are OK! 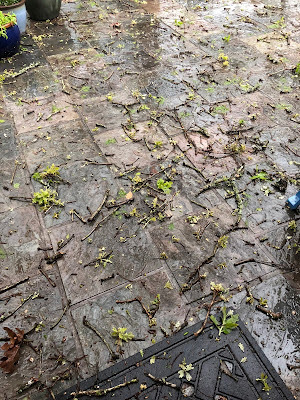 My parents are still in Florida and got that storm--lots of rain and their street flooded! Glad I missed all that. It was very intense, that's for sure! 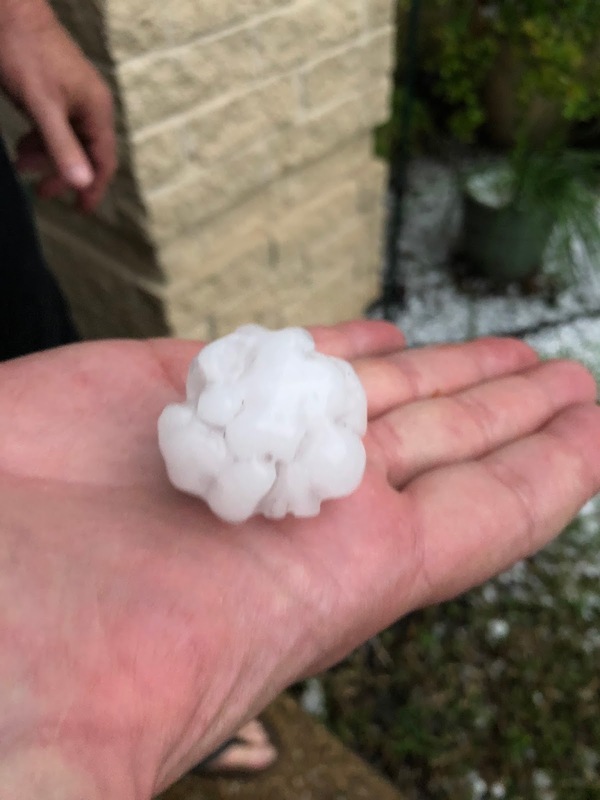 I'm glad your car wasn't out in all that hail - yikes! 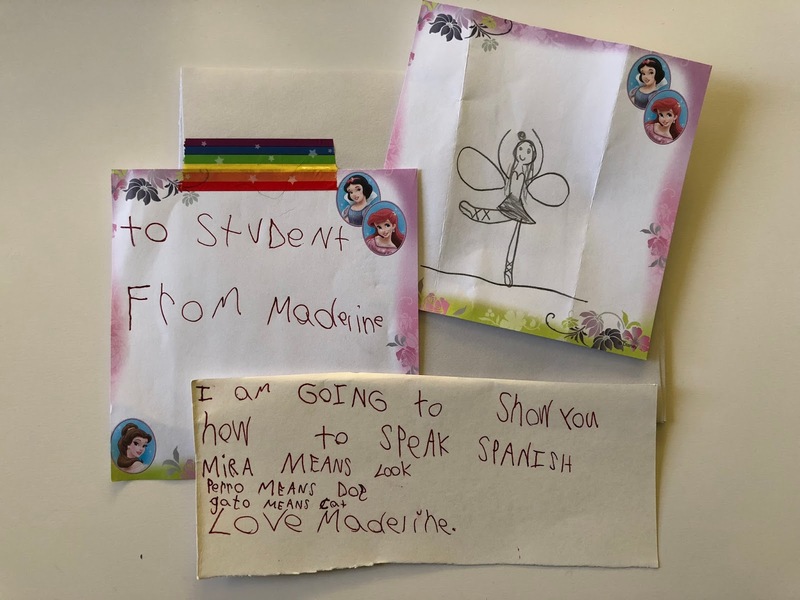 What an adorable note from your neighbor :D Spanish lessons with a side of cuteness! The Duchess was well-protected...luckily she's so small that even with moving things around in the garage for the reno, she can still squeeze in. Holy Hail that must have been a little scary! Is roof replacing expensive down there? I would be mad as hail if I had to replace a roof - our little garage roof cost $3000 so I'm sure the house would be 10-15K. Your towering inferno there is such a man idea. I mean that in a good way - it's like their brains function on an engineering level that most women wouldn't even consider. And now, I want spaghetti. I don't know how expensive it is to replace a roof but I'm about to find out. I think we pay a percentage of the cost when we have to file an insurance claim, which we definitely will be doing. That hail is really something! Brett had a hail storm last year and they had to have their roof replaced! Jeff's contraption is so funny. When I make my spaghetti sauce I want it to simmer for a long time too, but same thing happens on an electric stove. Even though there is a "simmer" setting on the burners. I swear, no simmer setting ever really works. So hey, just pile on the burners, LOL! Aww that is so cute that your neighbor girl is sending you a note to learn Spanish. Is she a Spanish speaker or is she just learning it in school? Out of all the weather, I absolutely hate hail the worst. Thank goodness we rarely get it here on the East Coast but last time we did (almost 10 years ago) it damaged my car really bad. I was so mad because I park my car in a garage her at home but at the time of the hail storm I was in town at a meeting! Your mail was adorable. How sweet of her to give it to you. Very cool simmering solution. But you're right, wouldn't work with little people in the house. 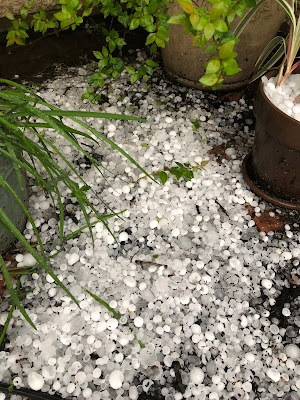 That was quite a hail storm! 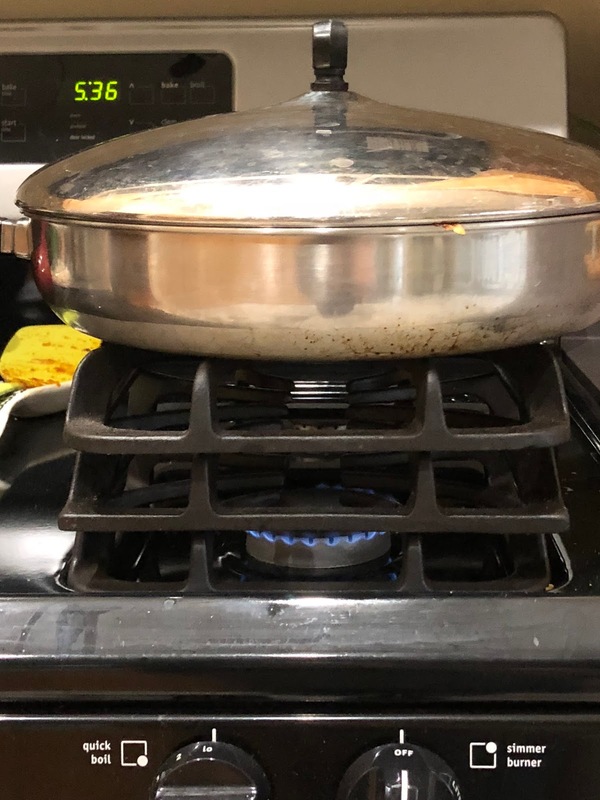 I remember when my brother built a house in Iowa before they moved to Texas, the stove they ordered with the "upgrade package" same with a gas stove that had an intermittent burner. At first I was like "what the hell is that?" But then I realized the burner would only turn on like every 30 seconds - enough to keep something simmering, but not enough for it to boil over - genius! Holy hail! So crazy! I am desperately waiting for temps over 40 degrees - this winter never seems to want to end! I hope your roof didn't get damaged! But how could it not? Eeek, that hail is INTENSE! My mother was always using it. I should too LOL! PS: Your hail is crazy! Haha Lisa's suggestion just might be your next click through money maker! Free food, Paco! I loved the letters! So precious! Do you know some Spanish? It seems like Madeline actually knows you pretty well, teaching you the word DOG on lesson one! And Jeff did make me laugh out loud, in case he is interested. That really seems like something my youngest son would do. And he is an engineer. Always thinking.